I like to read. I have more time now to read. I try to read a book a week. It doesn't always work that way as some books are too long, too boring, or some use really big words and I have to read those slowly to let the words digest in my brain so I can understand what is written. Anyway. I have decided that Tuesday would be a good day to talk about what book I have read in the past week or so. I was doing this previously but I have been a bit slack. Ok, by slack I mean lazy. Here's a book I read a while ago. I figure I won't actually read a book every week, so I will catch up eventually. This book is so sad. It's based on a true story about the author's 2 year old daughter (I think she was 2, like I said, it was a while ago!) falling victim to cancer. Oh so sad. I cried on the train while reading it! I don't know how many times I had to stop reading it so I wouldn't cry. But you know, I was annoyed a little by this book. Don't get me wrong, I really enjoyed it, but seriously, the 2 year old was talking in full sentences, so I am not sure if the child was a genius or if the author had a slightly skewed recollection of events. All that aside. Read it. It is beautiful and poignant. I really liked it and it breaks my heart to think that families have to go through these types of things. I feel like I should have something happy to follow that with. I don't. Sorry about that. I love to read true stories and discovered this book a few years ago. 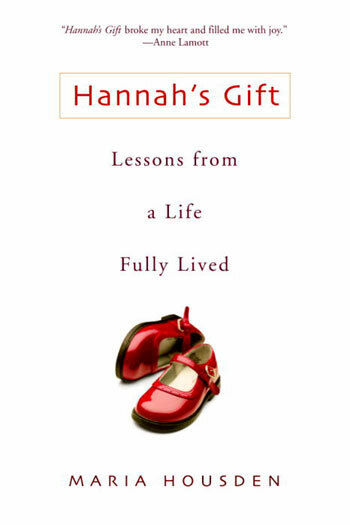 Like you Beth, I cried many times while reading Hannah's Gift. I remember thinking this child was very brave. It's not fair that so many families have to go through this situation and watch their child suffer with cancer. Another recent book I've read which you might enjoy is called Huck, written by Janet Elder. It's a true story of a little lost dog who changed lives and how the love of a pet can get you through anything. I have it here if you'd like me to post it to you to borrow sometime. Since I spend so much time travelling to and from work on the trains I tend to read a fair bit. Have a great week end. I might just take you up on that offer Susan. Instead of posting, I reckon we should arrange to meet up. It's been so long!